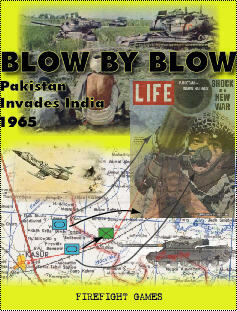 The Indo-Pakistani War of 1965, also known as the Second Kashmir War, was the culmination of a series of skirmishes that occurred between April 1965 and September 1965 between India and Pakistan. The war was the second fought between India and Pakistan over the region of Kashmir, the first having been fought in 1947. The war lasted five weeks, resulted in thousands of casualties on both sides and ended in a United Nations (UN) mandated ceasefire. It is generally accepted that the war began following the failure of Pakistan's Operation Gibraltar which was designed to infiltrate and invade Jammu and Kashmir. This is a wargame about the pivotal battle of Assal Uttar 1965 which was one of the largest tank battles after World war two. The Pakistanis launched an offensive to cut off the supplies to the city of Amritsar in the Punjab which was vital to tilting the war in Pakistan's favor. The Pakistani offensive was spearheaded by its Elite 1st Armored division comprised of M47 and M48 Patton and M24 Chaffee tanks. The Indian defenders had the 4th Mountain Division backed up by Sherman and AMX tanks but had the advantage of plentiful recoilless rifles, defending in poor terrain(sugar cane fields and rice paddies) as well as reinforcements in the form of the Indian 2nd armored brigade composed of Centurion tanks. The battle was pivotal and led to the loss of many Pakistani tanks. The area of the battle is referred to as Patton Nagar which means Patton city due to the large number of Patton tanks captured and destroyed during the battle. • Set of 280 ½" playing pieces representing ground combat units.